Our first, and as it turned out only, temple stop along the Philosopher’s Walk was at Honen-in. Why didn’t we end up making it to any other temples? Um. Because we spent too long drinking coffee and tea at various shops and eating dango and then — suddenly! — it was 4:30 and all the temples were closing. 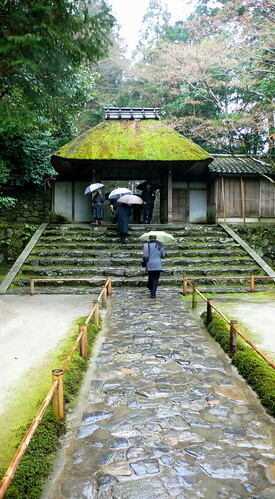 Anyhow, Honen-in is most famous for its ‘rustic’ thatched roof entrance gate, which is really quite beautiful, covered as it is with lime-green moss. There are also beautiful raked sand gardens which, because of the season, were inscribed with a blossom motif. Unfortunately the main buildings of the complex were closed due to a funeral, but on the other hand we did get to attend a gallery opening for a display of children’s art. The highlight of this opening, for me, was the colorful sumi-e wall hangings inspired by Tezuka’s Phoenix manga. There’s also a beautiful, moss-covered graveyard in the forest above Honen-in where the writer Tanizaki Junichiro is buried. 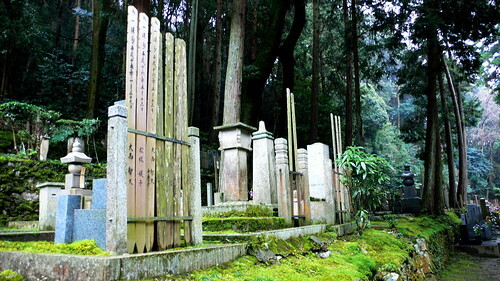 A view of the graveyard above Honen-in. 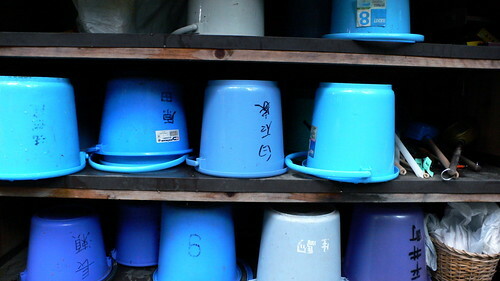 Buckets used for washing the gravestones. 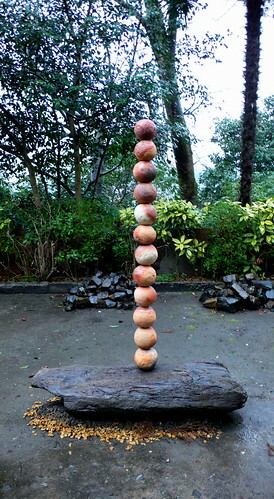 A wonderful ‘pagoda’ composed of stacked clay balls which was located behind a seperate stone pagoda at Honen-in.